Sundari: When the mind has had to overcome extremely damaging and destructive programming as a result of its difficult karma such as you have had, very often the default position of the mind is negative: tamas. It goes mostly unnoticed, as the abnormal has been normalized by the mind. To rise above this heavy blanket of tamas that covers the mind usually requires a Herculean effort which, more often than not, cannot be sustained. Occasionally there may occur a spontaneous bursting through the clouds, but even that never lasts long and often leaves the mind feeling worse than before because of the seemingly ephemeral nature of happiness. The only solution is self-knowledge – but even then – self-knowledge is not a quick fix or instant panacea. Those deeply entrenched negative vasanas are almost cemented into the neural pathways of the brain. They are like formidable opponents. BUT they are not stronger than self-knowledge, as they have nothing to do with you, awareness. The “magic trick” is to be able to identity these patterns in the mind and vigorously and valiantly dis-identify with them, 24/7 – if that’s what it takes. These tendencies are always there, and they might always be there, but they can be surmounted and ameliorated if self-knowledge is applied to them. In fact one can be free of them without them ever fully leaving the mind, as long as they are seen, understood and negated in light of self-knowledge. Swami Chinmayananda, James’ guru, said: “You have gone through ten Upanishads.Wonderful. How many Upanishads have gone through you?” Hence the conversion of intellectual knowledge into emotional strength is called nididhysana. If not, these vasanas will colour everything the jiva sees, that is a given. It is like the mind lives in a building with many windows, all of a different colour.Whichever window it looks out of, it will see the world coloured in that hue. As jivas we all have a subjective reality, but as peace of mind is the main aim of self-inquiry – and peace of mind can only be attained when the pressure of the vasanas is reduced sufficiently for self-knowledge to obtain (a clear window pane to look out of) – our subjective reality needs to be seen and understood for what it is: mithya, only apparently real. If we cannot see that, we will project this reality onto Isvara. And Isvara can only respond to us in like kind because Isvara is the deliverer of karma. So to change your world and your karma, the mind has to see and identify its habitual thinking patterns, especially those that are so ingrown that they fly under the radar of the intellect: the mind does not see or identify them, because they are so ever-present. Accept that the natural state of your mind is negative (even when you think it is not), look at that face-on, DROP the instinctive tendency to beat yourself up, feel bad, useless, etc. This only serves to immobilize and defeat you. It destroys self-confidence and turns the mind into a dithering mess, unable to think straight or clearly, overcome by darkness and confusion.Instead, see that you did not make the mind this way, but this is the mind the jiva has; there is no shame in this. To be free of it requires full understanding and acceptance, along with taking a stand in awareness as awareness, picking up the sword of knowledge and fighting this internal opponent! Never give in. Do whatever it takes for as long as takes, fake it till you make it. Without self-confidence, the knowledge will not work for you and you are dead in the water.At best it will give you intellectual comfort, but that is of little use to the jiva as it goes about its life in the world. 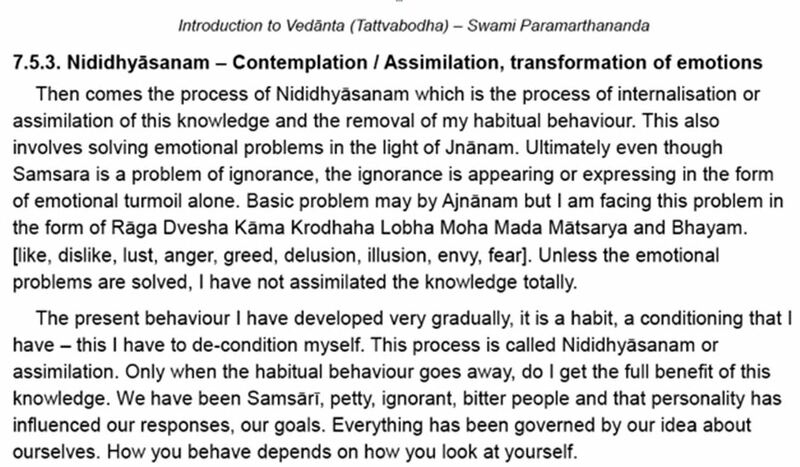 This is what James meant when he said Vedanta only really works when the jiva is happy – in other words, this means when self-knowledge translates fully into the jiva’s life, no matter what is happening or not happening in it. What you have not fully understood is how to apply triguna vibhava yoga. As awareness you are trigunaatita, beyond, or the knower of, the gunas. Even though you have knowledge of the gunas, the mind unconsciously identifies with them instead of indentifying with the one who identifies them. Your default guna can be any one of the three, but in your case the mind defaults to tamas. With awareness brought to the guna that generates the state of mind the mind is in at the moment, feeling helpless, overcome, uncertain, fearful, etc. (i.e. negative), you choose the guna that is a springboard for peace: sattva. Even your life in South Africa can be good if you take a different view towards it. It will be whatever you see it to be. If fear (i.e. negativity) is what drives your assessment of any situation, fear is what you will see and negative karma is what you will have. Fear and negativity attracts fear and negativity. Remember, Isvara is karma phala datta. Fear is a natural emotion, the downside of desire. To live happily it needs to be managed. Sometimes a fear is smart, sometimes it is not smart. Yes, if you are standing in the middle of the road and a car is coming toward you at sixty miles an hour and fear motivates you to move, fear is smart, assuming you enjoy living. However, most human fears are statistically challenged, gratuitous fears. The problem with fear is not the unfortunate consequences it causes you to imagine, but fear itself. There is ALWAYS another reality available to us other than the one fear/negativity presents. To manage fear, the threat of economic ruin, for instance in a country that seems to be on an unstoppable slide into economic disaster, one has to look at the big picture and how one fits into it. Whether one lives in what are considered “healthy” environments, like the U.S. or North-western Europe, the majority of people worldwide nonetheless live in fear of losing their money or something bad happening to them. Yet seen from the perspective of the big picture, people worldwide have less than a five per cent chance of experiencing mild to severe catastrophic events, also called “black swans,” even in stable countries like the U.S. Black swans are events that come “out of the blue” and can neither be predicted nor avoided. Yes, it is true that one sees economic depression and even ruin increasingly in the world. But even there, even in situations that seem so bad on the surface, life goes on and most get by; maybe not as well as before, but so what? In fact life will go along pretty smoothly apart from the usual ups and downs typical of life in samsara – which goes to prove that this is really a benign reality. Isvara is not “out to get us” at every turn, but can be trusted to be taking care of us for our best possible growth and sustenance at least 98% of the time. Regardless of what we have all been brainwashed to believe, the fact of the matter is that dharma is upheld 98% of the time throughout the field of existence. If it were not, we would all be refugees, packing guns and fighting for our lives, like the Syrian civilians are doing in a country where dharma has almost completely broken down. Notwithstanding seemingly endless evidence to the contrary, the dharma field can only function if dharma is upheld by the majority. It is a very small percentage of adharma practised by the minority that creates evil in all its forms – from the worst brutality to petty crime and economic depression – and infects all minds with the thought that life is difficult and dangerous for everyone and no one is to be trusted. Because of the nature of fear and maya’s power to delude, most of us live as though the facts were the other way around. In other words, we make the 2% of anything bad happening to us actually 99.999% to 98% that it will. One only has to look at the booming insurance costs to know this is true, which is why insurance companies make so much money, because they know that most of the time nothing bad happens! Just remember that Isvara will not interfere with your free will to continue living as you are, because Isvara sees you as perfect, as the self. To benefit from and gain the fruit of self-knowledge, it is up to you to make it clear to the field of existence what you are available for. So make it clear. Tell Isvara what you want – do the appropriate actions and stick with it!